[126 Pages Report] Refinish Paint Market for Automotive size was valued at USD 6.75 Billion in 2016 and is projected to reach USD 8.50 Billion by 2022, at a CAGR of 4.0% during the forecast period. In this study, 2016 is considered as the base year to estimate the size of the refinish paint market for automotive, while 2017 to 2022 is considered as the forecast period. To analyze, define, segment, and forecast the refinish paint market for automotive. Both top-down and bottom-up approaches have been used to estimate and validate the global size of the refinish paint market for automotive and estimate the sizes of various other dependent submarkets. The research study involves the extensive use of secondary sources, directories, and databases, such as D&B Hoovers, Bloomberg, Chemical Weekly, and other government, private, and company websites to identify and collect information useful for this technical, market-oriented, and commercial study of the refinish paint market for automotive. After arriving at the overall market size, the total market has been split into several segments and subsegments. 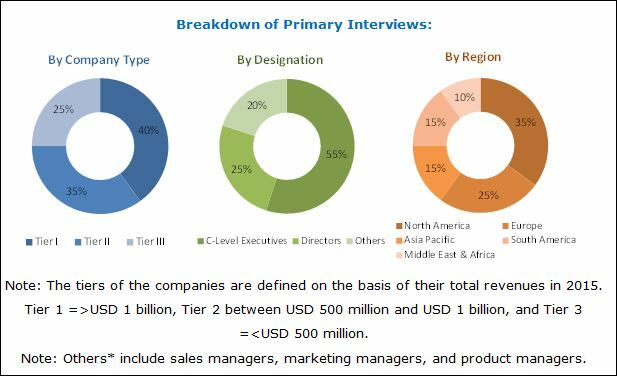 The figure given below provides a breakdown of primary interviews on the basis of company type, designation, and region during the research study on the refinish paint market for automotive. 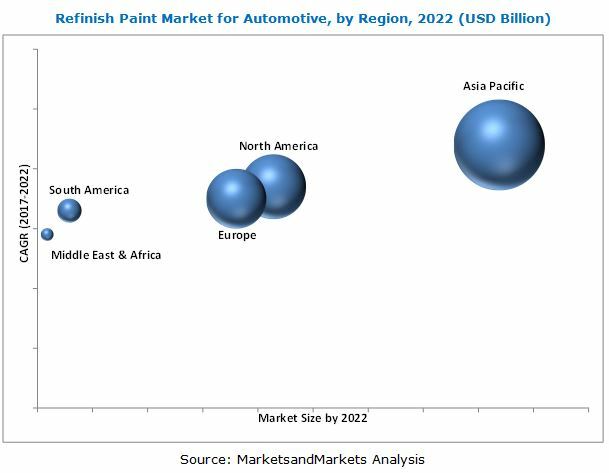 The refinish paint market for automotive has a diversified and well-established ecosystem of upstream players such as raw material suppliers and downstream stakeholders, such as manufacturers, vendors, and end users. Axalta (US), PPG Industries (US), BASF (Germany), Sherwin-Williams (US), Kansai Paint (Japan), Nippon Paint (Japan), KCC Corporation (Korea), and AkzoNobel (Netherlands) are some of the leading manufacturers and suppliers of automotive refinish coating. This research report categorizes the refinish paint market for automotive based on resin, technology, layer, vehicle, and region. A country-level analysis of the refinish paint market for automotive based on all segmentation considered. The refinish paint market for automotive is projected to grow from USD 7.00 Billion in 2017 to USD 8.50 Billion by 2022, at a CAGR of 4.0% from 2017 to 2022. Major factors driving the refinish paint market for automotive are the increasing demand for vehicles, collision rate, and the ability of car owners to repair their vehicle post-collision. The polyurethane resin segment accounted for the largest share of the overall refinish paint market for automotive in 2016. The growth in this segment is backed by its preference in clearcoat and basecoat layers due to its excellent weather, corrosion, and mechanical resistance. Basecoat and clearcoat are the most important layers in automotive refinish coating process. Basecoat provides color and aesthetics and offers protection from corrosion. Clearcoat protects the basecoat and offers lustrous look. Basecoat and clearcoat considered together as topcoat which has major dominance in automotive refinish coating process. The passenger car segment led the refinish paint market for automotive and is expected to maintain its dominance during the forecast period. Increasing number demand for cars in emerging economies such as China, India, Mexico, and others is driving the segment. The growth is also backed by the rising income of middle-class population and increased propensity of car owners to repair their vehicle post any collision. Factors such as volatility in the prices of raw materials may restrain the growth of the refinish paint market for automotive, globally. Axalta (US), PPG Industries (US), BASF (Germany), Sherwin-Williams (US), Kansai Paint (Japan), Nippon Paint (Japan), KCC Corporation (Korea), and AkzoNobel (Netherlands) are some of the key market players in the refinish paint market for automotive. Diverse product portfolios, strategically positioned R&D centers, continuous adoption of various growth strategies, and advancements in technologies for the development of new types of products and technologies are the factors responsible for the strong position of these companies in the refinish paint market for automotive.